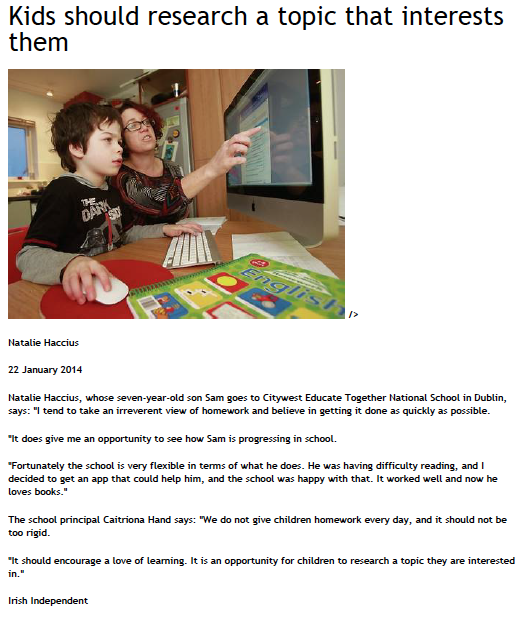 Media - Citywest Educate Together N. S.
We were given a brief mention in this Irish Examiner article. 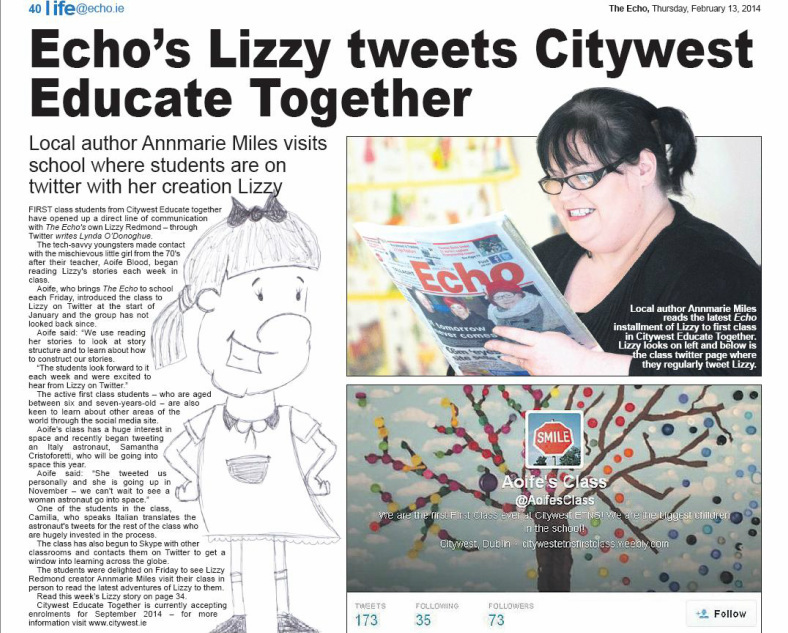 -Courtesy of The Echo Newspaper. 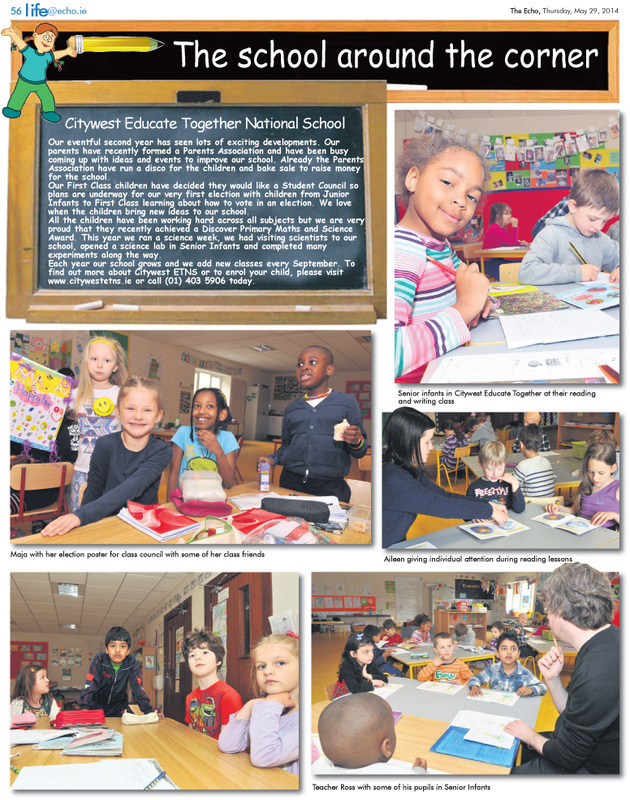 Here is a link to a story the Irish Independent ran in February in relation to the Department of Education buying our school complex. In the Celtic Tiger era the airy rooms with the vast windows in the Citywest complex were set to become shops selling designer goods. Now they are the classrooms of two gleaming new national schools. The building was originally part of developer Jim Mansfield's pipe dream for a Boutique Golf Village at Citywest, where visitors could shop for clothes, possibly after playing a round. Jim Mansfield never managed to open the shops, and his property empire has since collapsed. After the Golf Village project floundered, Mr Mansfield announced grandiose plans two years ago for a Citywest Institute of Education, where Saudi students would learn English.This project never got off the ground either, but the building has been saved from oblivion in an unlikely way. 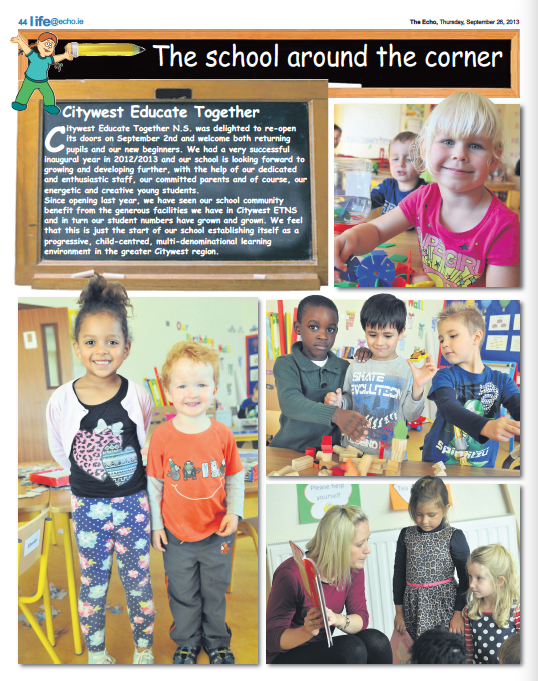 In recent days, excited teachers, parents and children have been celebrating the the opening of Citywest Educate Together School and Scoil Niamh Community National School. The schools are side by side in the shopping centre that never opened. With a shortage of school spaces in the area, the Department of Education and Skills stepped in earlier this year and leased the building from the receivers of Jim Mansfield's company. As a result of the building's chequered history, the new schools come with mahogany fittings and luxurious toilets. The schools have opened at extremely short notice. After the schools were given the go-ahead in May, principals were appointed and builders made the necessary changes over the summer. Staff were only given the keys to the building two days before they opened and there was a frantic rush by parents and staff to kit it out for the school's opening. Caitriona Hand, principal of the school, was delighted with the new accommodation at the opening. "We are spoiled for space, and because the classrooms were supposed to be shops the light is great.'' At next door's Scoil Niamh, which is run by the Co Dublin VEC, principal Seamus Conboy says: "The building is finished to a very high standard." The two new schools share a playground, and are staggering their starts and break times. "It was a very proud day for us to bring life back to the building. When we first saw it in May it looked very bleak and soulless," said Seamus Conboy. The aborted plan for an Institute of Education for Saudi students on the site has brought benefits to the schools. As a result the classrooms came equipped with interactive whiteboards. Some of the areas had to reconfigured, because it was intended that men and women would be strictly segregated in certain areas in the Saudi school. The receivers who took over Jim Mansfield's company are not the only ones giving the go-ahead for disused buildings to be turned into schools and colleges. NAMA has committed itself to giving priority to public bodies when they are seeking property, including schools and college. A NAMA spokesman outlined some of its recent moves to make land available for education. The sale of a 13-acre site in Hansfield, west Dublin, to the Department of Education. The sale of a three-acre site in Galway for the development of a new school. NAMA has agreed the sale of 125 acres of land at Curraheen, Co Cork, formerly owned by developer John Fleming, to the Munster Agricultural Society and UCC. Another site was sold recently to UCD. 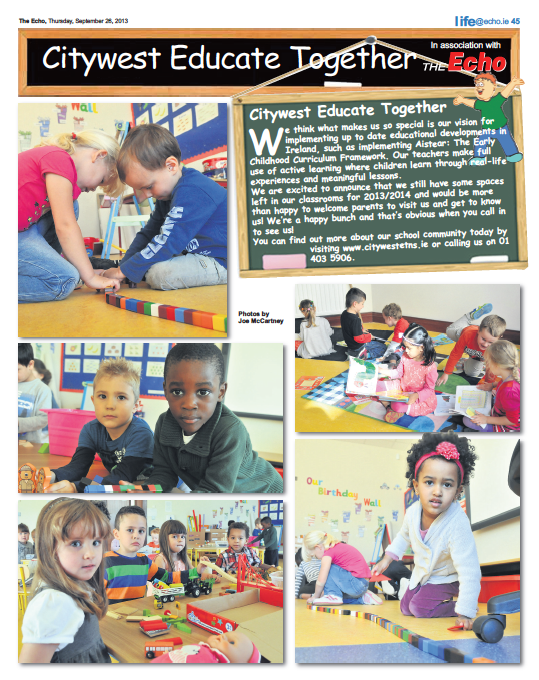 The opening of the new Educate Together school at Citywest was the result of tireless campaigning by a group of active parents. Parents have a powerful influence in Educate Together schools, especially when they are opening for the first time. "When Cheile was in Junior Infants we drove her to another county so that she could go to an Educate Together school (in Blessington, Co Wicklow). Now I am glad that I have a school close to home." 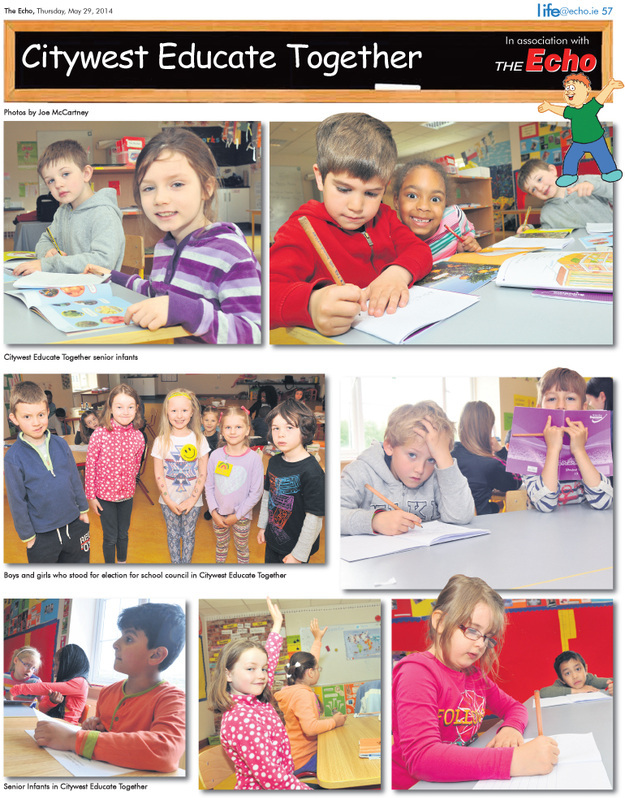 Department of Education planners began to recognise the need for the school last when the census showed that the local area had one of the fastest upsurges in population in the country. Principal Caitriona Hand was previously head of Coralstown National School in Co Westmeath, while classroom teacher Ross O Corrain previously taught at Portlaoise Educate Together National School.